FREE UPS GROUND* to 48 States! These bikes will sell out very quickly. Grab yours now, we will sell out of them. 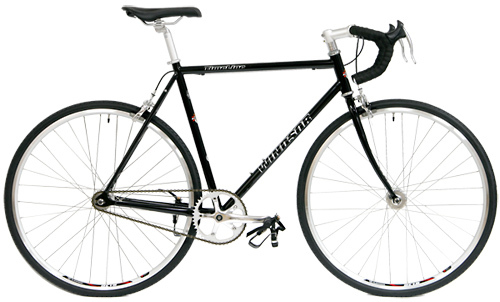 The Windsor Hour has been such a hot seller and now Windsor has come out with the TimeLine singlespeed bikes. The TimeLine has a strong and comfortable riding 4130 CrMo frame and fork. The TimeLine comes standard with 700x32c tires and can take wide tires up to 700x42c or even some 29x1.75". This new design gives the rider extreme performance and versatility for virtually any road or even semi-offroad condition. Extremely limited shipment of these beautiful track bikes. Custom Butted and Tapered 4130 Chromoly Steel Track frames. We are blowing these out for Windsor as a special promotional deal. The Rear FLIP/FLOP HUB comes with a freewheel cog for easier pedaling. Trackies can add their own fixed cog on the other side. We highly recommend the installation of Front and Rear brakes for street use. Frame Windsor Custom Butted and Tapered 4130 Cromoly with Track Dropout 120mm width, Externally butted seat tube, single water bottle mount, Rear RACK braze on mounts, front and rear fender mounts. Hubs Formula TrackSpec Silver Anodized Aluminum, High Flange, sealed cage ball bearings. 32 hole. Front and Rear FLIP/FLOP HUB with BOTH freewheel side (installed) and on the other side you can install your own fixed cog. Bolt-on M-10 solid axles, not quick-release. Front 100, Rear 120mm. WHILE THEY LAST - SAVE OVER 60% OFF + Free Shipping to 48 states!